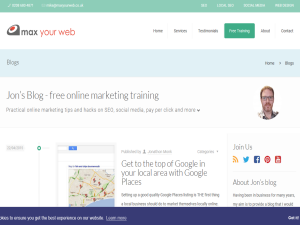 Max Your Web are a well established, highly experienced company specialising in helping businesses of all size to grow via their online presence. From designing high quality websites, to implementing effective SEO strategies to Social Media and Pay-Per-Click management, our range of services are designed to meet your expectations and goals at the earliest possible stage. We keep things simple and up-front at all stages of our work and whether you are a small, local business or something much larger, our skilled team are poised and ready to help. Contact us today for details.